Stig Jarle Hansen critisising Norwegian investors for not having acquired local knowledge in order to avoid violence in the oil fields. 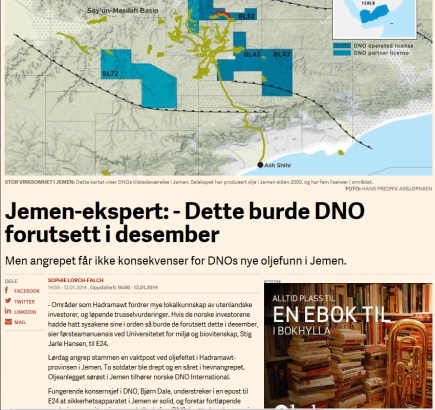 Oil plant in southeast Yemen in Hadramawt province where two soldiers were killed and one injured in revenge attack, belongs to Norwegian DNO International. "Areas like Hadramawt require much local knowledge to assess and tackle ongoing threats. The Norwegian investors should have been able to avoid this incident, says Associate Professor at the University of Life Sciences, Stig Jarle Hansen".